I’m just going to be blunt about this: I hate Ed Hardy. 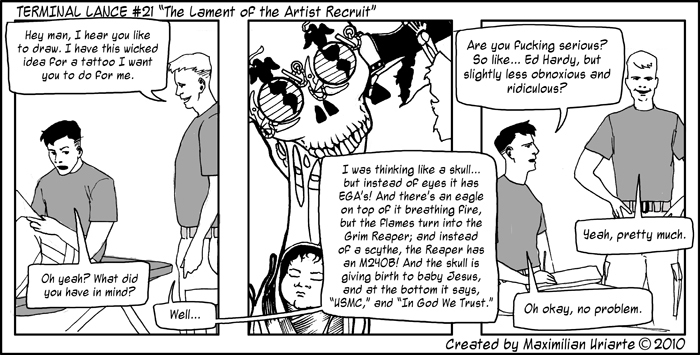 At first I wasn’t sure if I should even bother doing this strip; I realize most Marines in the Marine Corps are actually the guy asking for the tattoo, and not the one drawing it. Unfortunately for you all, I am the one drawing it, as well as the one making the comic that has been bestowed in front of you. Ultimately I think people can still appreciate the humor in it–though I’m not sure if it’s more making fun of Ed Hardy or just lame tattoo ideas. Then again, sometimes those can go hand-in-hand. It is a strange path in the Marines–as it has been made painfully obvious to me, 99% of the Marine Corps has very little artistic talent. While this is not particularly unusual, it really puts the heat on us few that do. Being the minority artist in a room full of young, tattoo-craving men usually spurs some kind of conversation involving something completely ridiculous embedded permanently in ink into their flesh. I won’t lie, this is an exaggeration and amalgam of various requests said to me via Marines with too much money to blow. Typically though, it usually involves something motto, something religious, and a skull (or something with a visible skull). Sometimes the requests are more amusing than interesting, hence what spurred this strip. Ultimately though, the reason I decided to do this strip is to make a proposal to you all: I have a deal for you. The first person to get this tattoo actually tattooed on their body will receive the original artwork, framed and autographed by yours truly. In addition to that, you will be full of win for the rest of your life. If you are interested in this, send me an email using the contact tab at the top of the screen and I will send you the full sized image for you to print out and give to the tattoo artist. Tell him/her that you’re full of win, and you need this tattoo now. Disclaimers: I will not pay for your tattoo. In addition to this, the original artwork will be given to the FIRST PERSON that completes the tattoo task. Unfortunately there is only one original piece, and I can only give it to one person. Please inform me of your intent to get the tattoo, I will let you know if anyone is already in the process of doing it. I will not be held responsible for any permanent awesomeness put onto your body that doesn’t result in receiving original artwork by me. As well, there can be no changes made to the design of the tattoo, and you must provide me with photographic (or video) proof of your deed. When you email me, please give me your rank and name so I know you’re legit. Again, ONLY 1 PERSON CAN RECEIVE THE PRIZE. LET ME KNOW OF YOUR INTENT TO GET THE TATTOO PRIOR TO GOING OUT AND GETTING IT. With that said, I hope someone has the testicular fortitude to get something this ridiculous and awesome tattooed on them. When there is a winner, their pictures will be put on the next scheduled comic post. I know Marines love tattoos, don’t let me down now.